Chocolate ice cream cone, coming right up! Spoiler alert. This post is not about ice cream. I know, I know. I’m breaking a cardinal rule of this blog. But, if you quit whining for 10 seconds and continue reading, you’ll see that this post is definitely in the spirit of ice cream. In fact, it’s a perfect “frozen treat” for the fall and winter months. My office hosts an annual secret snowflake gift exchange during the holiday season. For the three weeks prior to the gift reveal we are left with little clues and gifts from our secret snowflake. Last week, I received two adorable cookie cutters and one, of course, was in the shape of an ice cream cone. Wanting to use up some leftover ingredients in my kitchen, I immediately decided that rice krispie treats were in order. 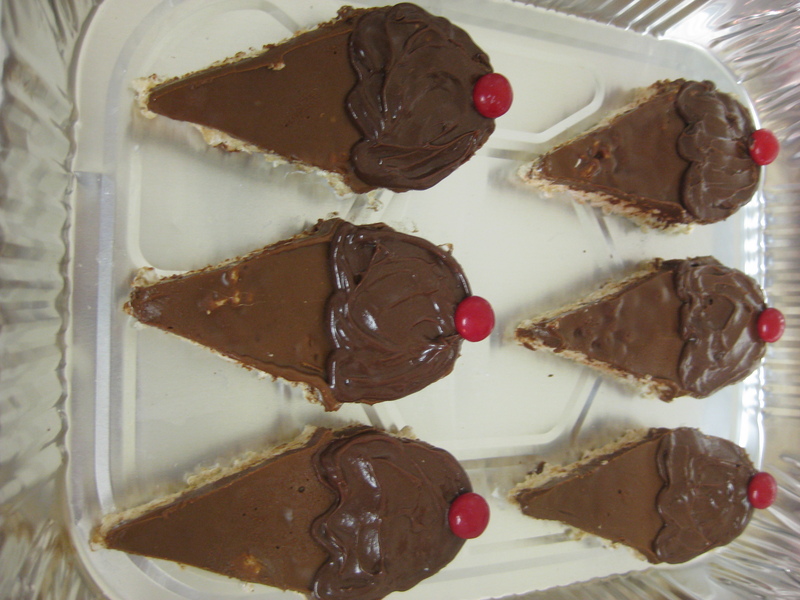 I marched home and started cooking, and these cute creations are the result of lots of fun in the kitchen. Since I’m so used to making ice cream, I don’t really have as many baking tools as I do ice cream tools, so anyone with a formal baking education would have gotten quite a chuckle seeing me pipe chocolate icing with a ziploc bag! But, like the old adage says, it’s not what you do, but how you do it – and let me tell you, I did this with dedication and a positive attitude! Mmm...Fluff and butter. What could be better? Spray the bottom of a 9×13 baking dish. Set aside. 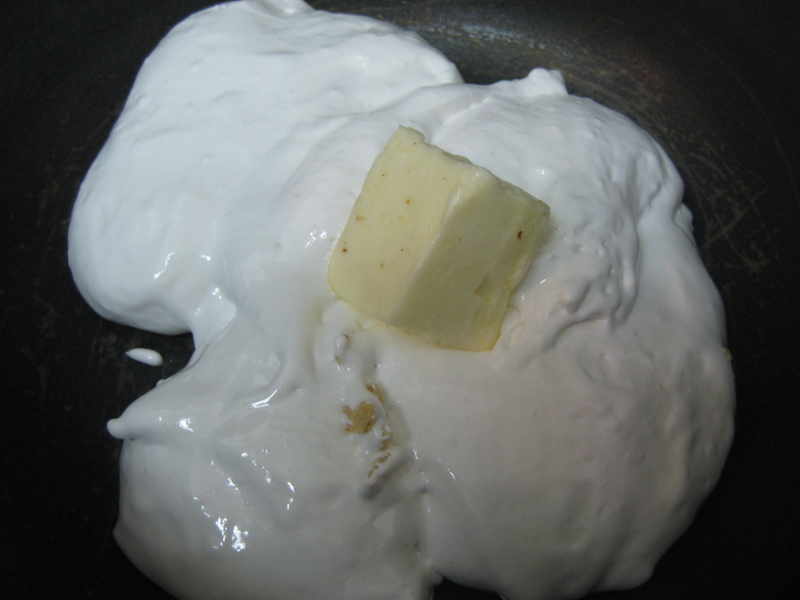 In a saucepan, melt the butter and marshmallow fluff until the butter is fully melted and dissolved into the fluff. 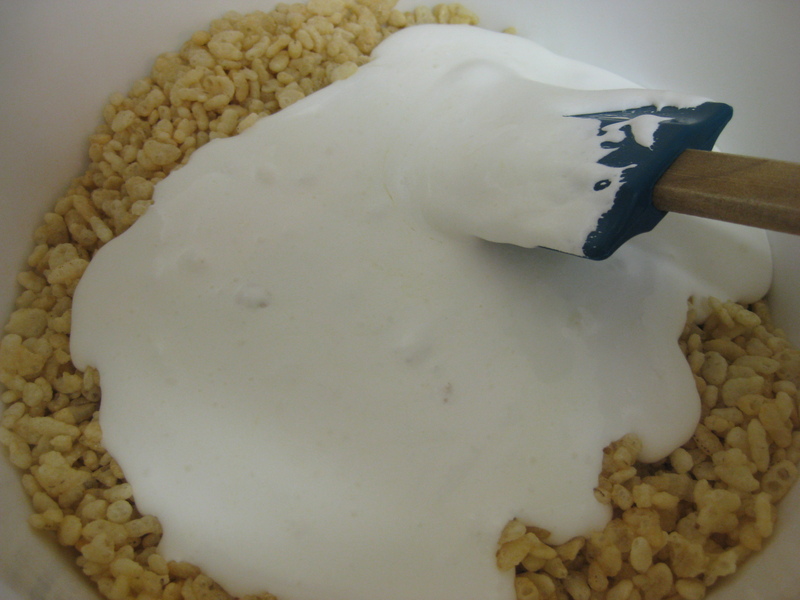 Remove from the stove and pour over the rice krispies. Stir well so that the mixture is completely blended. Pour the mixture into the baking dish, cover with saran wrap, and flatten out. Using the saran wrap is a neat trick because it saves your fingers from getting covered in a sticky mess, while enabling you to smooth out the rice krispie marshmallow mixture. Rinse the sauce pan for round two. 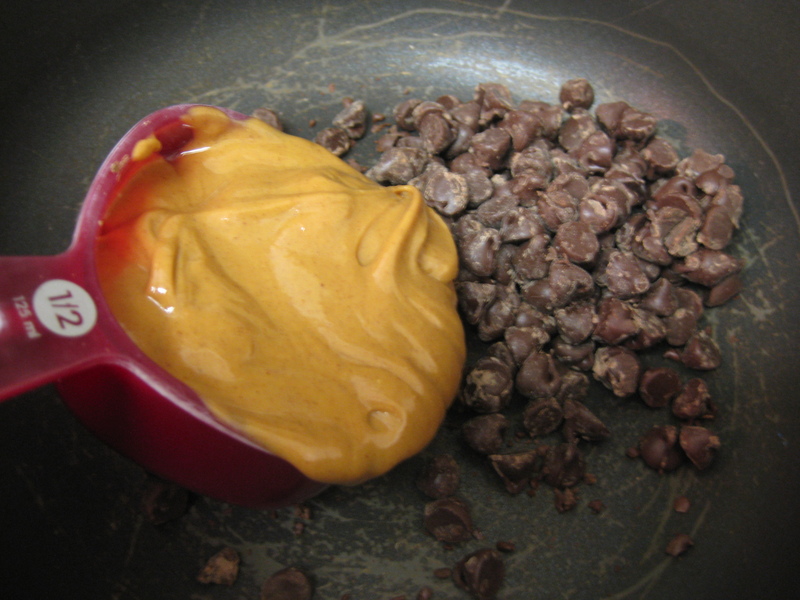 Melt the peanut butter and chocolate over a low heat, stir frequently and remove from heat as soon as it’s fully melted. No one likes burnt chocolate – so be careful! 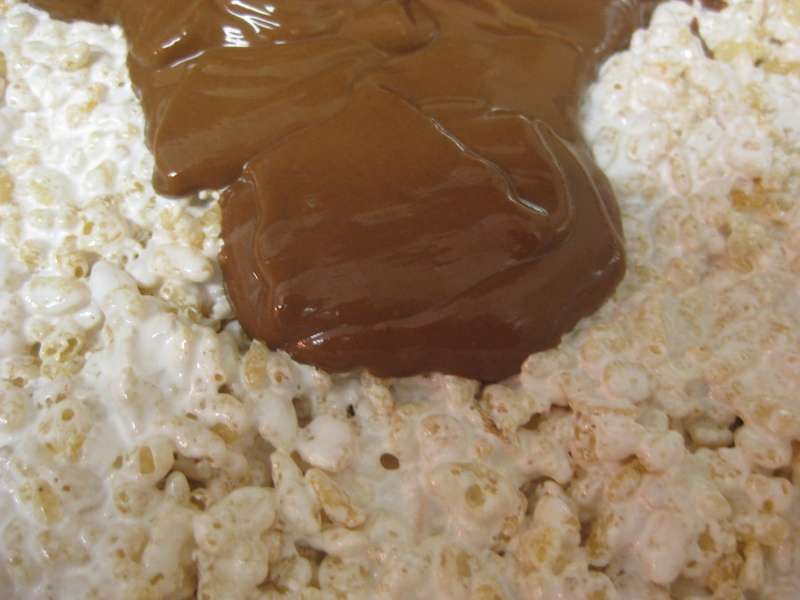 Pour the chocolate peanut butter mixture over the rice krispie treats and refrigerate for at least 1.5 hours or until the chocolate peanut butter topping has completely hardened. 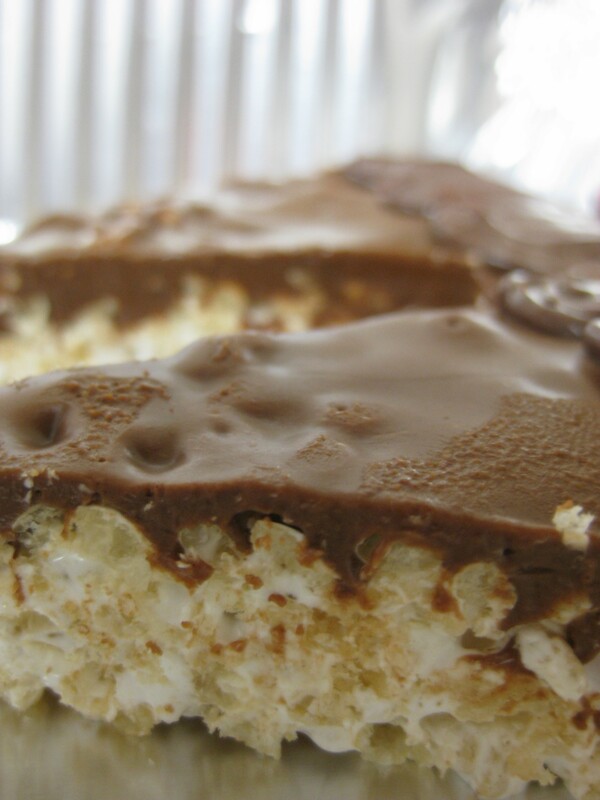 If you are in a rush, feel free to freeze the bars instead until the topping has hardened. 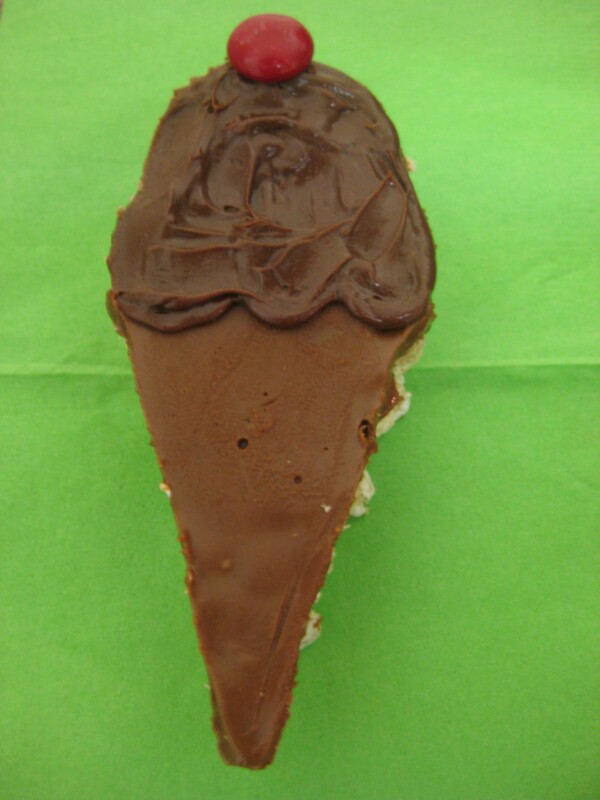 Once hardened, use the cookie cutter and cut out individual ice cream cone treats and set aside. Cutting out the "ice cream cones"
For the last step, you’ll need to channel your cake decorating skills. In the microwave, melt the chocolate frosting for 10-15 seconds so it’s thinner and more liquid. 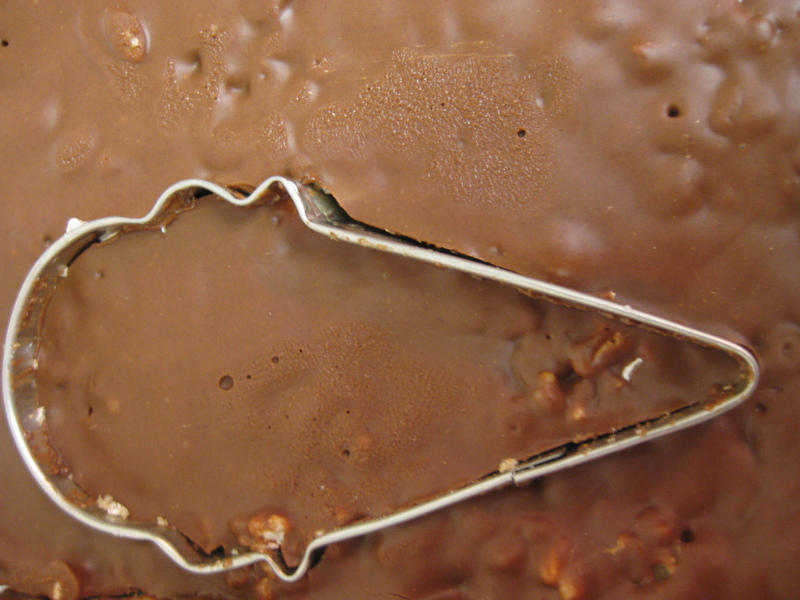 Pour the melted chocolate frosting into a ziploc bag. Using sharp scissors cut a very small piece off the bottom corner of the bag. Remove all the air from the bag, push all the frosting towards the bottom of the bag, and seal the ziploc. Look at those adorable ice cream cones! You will use this frosting to create the “ice cream” scoop. Squeeze the bag very lightly, and in one fluid motion, create three ‘u-shapes’ mid-way down the ice cream cone. This will be the bottom of the ice cream scoop. Fill in the whole area with frosting, and if necessary, smooth with a knife. Repeat this process on all the cookies. If you are feeling particularly artsy, try making half with chocolate frosting, the other half with vanilla. Top with a red M&M and enjoy! The Verdict: If you like chocolate and peanut butter, this treat is for you. The Husband loved them, and I think my office enjoyed them as well. I thought they were good, not amazing, but still tasty! Definitely store these in the refrigerator, they’re best when served chilled. Enjoy!